Experimentation and innovation define Sacaiâ€™s collections. Bold shapes and tactile materials lend comfortable, casual active-inspired pieces a youthful finish. 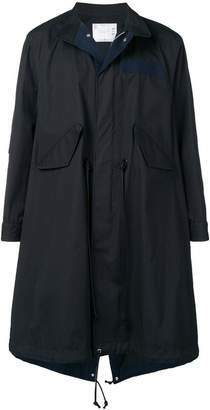 This navy blue cotton drawstring waist trench coat from Sacai features a high standing collar, a button over front zip fastening, long sleeves, side pockets, a mid-length and a drawstring hem.